It is being reported that ISIL has destroyed the gate of Mashki in Nineveh on the outskirts of Mosul. 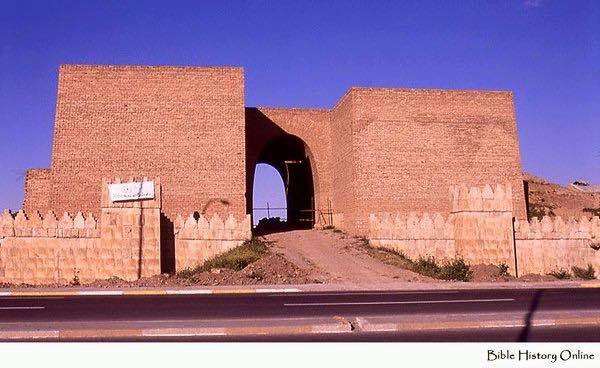 This is on the NW side of the town and was one of 15 gates in the walled area of Nineveh and one of those between the modern town and the open area to the east. What was seen there was largely modern reconstruction built after 1968. This follows the reported destruction at the end of January 2015 of considerable lengths of the city wall. Donna Yates says we should disregard such 'unconfirmed' reports from activists on the ground and wait for official confirmation that they are telling the truth. I presume she's phoning the press office of the ISIL emir in Mosul now to get that confirmation. When is a "monuments man" not a "monuments man" I wonder? Well, let us see what she comes up with. While the earlier reports remain lacking in "confirmation", it is now being said that two more gates have been taken down, the Nergal Gate and the Adad Gate. Time to put a site plan up. So, the National Geographic beat Donna Yates to the confirmation she sought "Exclusive Photos Show Destruction of Nineveh Gatesby ISIS". It seems the Nergal gate was not as badly damaged as first thought, the others have gone though.